Biodegradable cleaning for practically any surface. Sansin Multi-Wash is a concentrated, biodegradable cleaner designed to be diluted to an appropriate strength for almost any job. 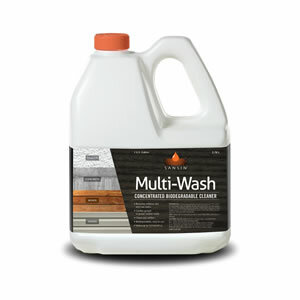 Multi-Wash works to remove mildew, dirt, rust stains and more. Simply apply an appropriately diluted version of Multi-Wash to the surface and allow it to wet the contaminants for 5 minutes or more; follow by rinsing well with pressure washer or garden hose – and watch your surface come clean. In concentrated form, Multi-Wash can be used as a pressure washer cleaning agent additive. View the Multi-Wash Product Data Sheet (PDF) for information about application, preparation, maintenance, and more. View the Multi-Wash Safety Data Sheet (PDF).